A day ahead of the formal announcement of an alliance between the Bahujan Samaj Party and Samajwadi Party by Mayawati and Akhilesh Yadav, BJP chief Amit Shah dismissed their alliance and exhorted party leaders and workers in Uttar Pradesh to prepare to fight for a vote share of more than 50 percent. 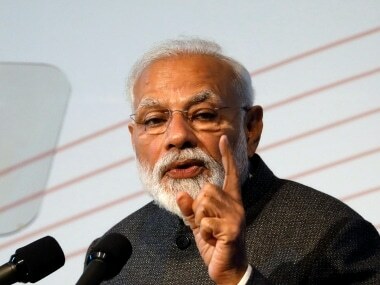 Shah spoke about an emerging “Modi versus the rest” situation in the upcoming parliamentary polls, and asserted that such a scenario would ultimately benefit the party, as people would see the negatives of the Opposition parties' game. On Saturday, Yadav and Mayawati will, for the first time, share a dais to put forward their "remove Narendra Modi" agenda. Speculation on such an alliance had been going on for months, and this speculation is expected to turn into reality on Saturday, when the two will address the media at Lucknow. The Congress, however, does not feature in this coalition. It has been left to fend for itself alone. The only consolation for the Congress will be that Mayawati and Yadav will not field any candidate against Sonia Gandhi in Raebareli and Rahul Gandhi in Amethi. That essentially means that the Congress' fate in almost all the seats in Uttar Pradesh, except Raebareli and Amethi, has already been sealed. The BSP-SP coalition poses a big challenge to the BJP’s current hegemony, both at the Centre and in the state. While the BJP has been gearing up for such a situation, it was important for Shah to reformulate his party's strategy and keep up the morale of party workers. The meeting of the BJP National Council, where 12,000 delegates from across the country have arrived, gave Shah a good opportunity to talk about the possible challenges that the SP-BSP coalition could pose. While the actual strategy would be formulated behind closed doors after due deliberations with a select group, and quietly unveiled on the ground, it was important that Shah addressed the issue directly. The BJP chief sought to instill confidence among party workers that they constitute a better fighting force and are better placed than the leaders of the mahagathbandhan. However, going by the strength of the SP and BSP and their vote share in previous elections, it is clear that their alliance will be a formidable force. Shah, in his inaugural address at the National Council meet at Delhi's Ramlila Maidan, spoke at length about the so-called mahagathbandhan. He termed the grand coalition a “dhakosla” (sham), and said that it involves some state leaders coming together, without one having any presence or influence in other states. Earlier, at a News18 conclave, Shah had said that the mahagathbahdan holds meaning only in Uttar Pradesh, where it poses a major challenge to the BJP. However, speaking at the party’s conclave, Shah said, “I am in regular contact with the party workers and leadership in Uttar Pradesh”. Shah expressed confidence that the party's tally in Uttar Pradesh would go up from the current 73 to 74. He said, "Now, bua and bhatija (Mayawati and Yadav) are going to fight against us. It is not for the first time that parties that did not see eye to eye earlier have come together to keep themselves relevant, and to somehow escape from the existential crisis that they are facing. This is because of the popularity of Modi and the strength of the BJP." The BJP chief recalled that during the Uttar Pradesh Assembly elections, the Samajwadi Party and Congress had come together, and the BJP had contested alone. In that election, the BJP won 325 seats. Shah suggested that the SP-BSP coalition would meet the same fate. 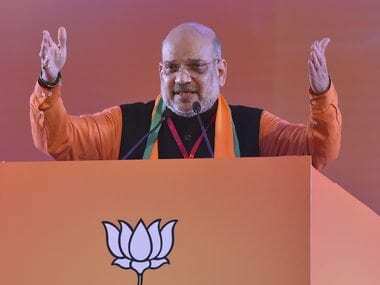 Shah spoke in detail about the Modi government's decision to grant 10 percent reservation to economically weaker sections. The BJP appears to be seeking the support of the upper castes with renewed hopes. During his address, Shah asked all the persons present, including the people on the podium and those in the audience, to stand up and cheer for Modi. Shah also mentioned the Kumbh in Prayagraj, and asked his party workers to take a dip at the River Ganga there, and work during the elections with renewed vigour. The Yogi Adityanath-led government in Uttar Pradesh has thrown all its might into making this edition of the Kumbh a great success, in terms of preparedness as well as popular participation.